(Power Pack I#47 (fb) - BTS) - For aeons, the Mother-Goddess watched over Elsewhere, but the kings came to resent the feminine nature of her energies and sought to harness energies of their own to mold to their will. For a time, the Mother-Goddess aided them as their Oracle, but ultimately the kings forgot everything. The Mother-Goddess subsequently had little to do with the goings on in Elsewhere but still tried to keep an eye on things. Each generation she took the form of a queen that she might have some influence on the Poobah kings. Bossko's laundry operation receives garments from all over the multiverse. While it is a big operation, they pride themselves on service and attention to detail. If any of their customers have problems or special requests, they could just put a note in their pocket, and when they next summoned their costume, the request would be taken care of. Each arriving item has an ethereal "tag," which allowed them to send that item back to its appropriate dimension whenever its owner willed it. At some point, the Kymellian Aelfyre Whitemane learned of the dimension known as Elsewhere and made arrangements with its inhabitants to care for certain costumes . 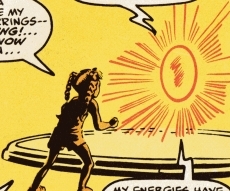 (Power Pack I#47) - While the four Power kids were trying to switch costumes to match their exchanged powers, Katie Power fell into the aperture within Julie's costume's pocket. She then passed through a laundry chute and was dumped into a bucket where a bunch of Mr. Clean-looking guys started to scrub her. 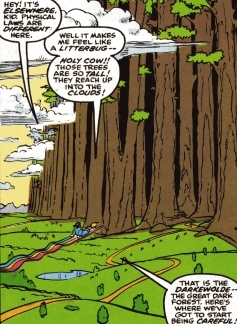 She got annoyed and started to fly off (with the Lightspeed/Starstreak power she had at the time), but in Elsewhere the rainbow energy she left behind while flying was solid, and the guys grabbed her rainbow and pulled her back down to them. She was hung up on a laundry line in the Lost and Found area until Bossko, the head of the laundry/garment district, released her from the rainbow trail she was hanging by. Unfortunately, because Katie had somehow slipped in without a tag, Bossko didn't have any way of sending her back home; however, he agreed to take her to see the King of Elsewhere who could help her. 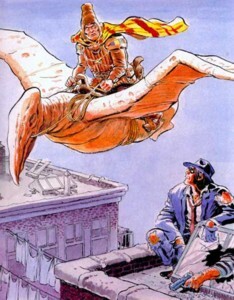 Under Bossko's guidance, Katie flew them both to Darkewolde, but her power ran out and they crashed. Unable to find their way back to the path as a group of Rocs were hungrily devouring Katie's rainbow trail, they stopped to ask directions from a woman who left them to babysit her kids in exchange for directions in Darkewolde. After an exhausting evening with her wild kids, the two slept well, only to learn the woman couldn't help get them get out of Darkewolde. As they continued their trek, they were captured by Rocs, who were grateful for the delicious "ribbon candy" Katie had left them, and they flew her and Bossko to the capital and the Palace of the Poobah. 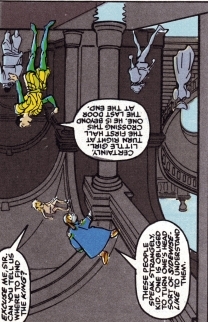 After a dizzying trip through the palace, they encountered King McCay, who recognized them but unfortunately decided that Katie couldn't go home because she didn't have a tag; however, he did tell them that the Oracle might know a way out for her. Searching for the Oracle, they found Queen Sen Suwanda who brought them to a gem with which the queen merged to become the Oracle. She then used the location of Katie's costume on Earth-616 as a beacon to send her home, and Katie hugged and thanked Bossko for his help before departing. Katie's siblings were skeptical of her story of what happened until she showed them how to switch their costumes as they wished. 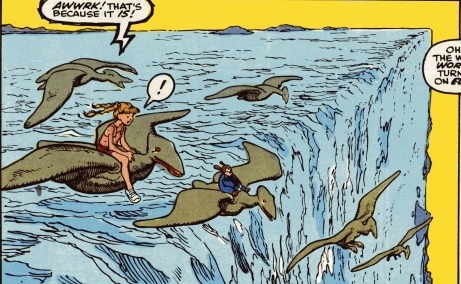 (Power Pack I#49 - BTS) - When Katie put a note in her regular clothes pocket for Bossko, asking him to modify the team's costumes for operating underwater, much to the surprise of her skeptical siblings Bossko (and presumably the other helpers of Elsewhere) changed the boots to flippers and added helmets with air supplies. 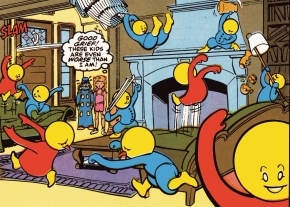 Due to the difference in time rates between the dimensions, these modifications were done to the suits during the time it took Power Pack to switch between street clothes and costumes. Almost all the people in Elswhere are based off of classic comic strip characters from the earliest days of the genre (i.e. late 19th century/real early 20th century strips, like Maggie and Jiggs, Katzenjammer Kids, Little Nemo, etc.). 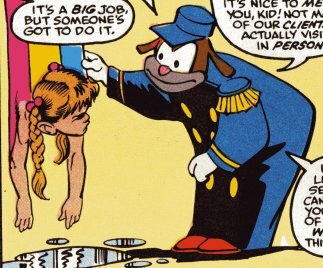 Could also just be that the artist just wanted to invoke the memory of those old strips, instead of doing actual homages to specific characters. The Cleaners seem to have, as a paritial influence, Richard Felton Outcault's Yellow Kid character. Not knowing all the strips referenced, I'd certainly confirm that McManus and Sen Suwanda were based on Jiggs & Maggie, from the strip also known as "Bringing up Father." Julie Power described Katie's Elsewhere adventures as "sounding like about a half dozen books I've read all mooshed together..."
That may be significant, as Julie did have several such books in her costume's pockets, and it seems quite likely that Elsewhere's appearance may change according to the subconscious thoughts of those present, or of nearby ideas. Just wanted to point out that Castle Windsor of the Keep McCay is a definite reference to Winsor McCay, creator of Little Nemo in Slumberland. It's not specifically stated that Elsewhere was a magical realm, but it would certainly seem to be. --this was before the explanation tying the mass exchange it to Kosmos. Otherwhere may or may not be associated with Kosmos. Head of the laundry/garment district, he accompanied Katie on her trek to see King McManus to help her get home. Aka the Palace of the Pooba, it was home to King McManus and was an orientation nightmare, with gravity seeming to exist in many directions at once. Patterned after "Mr. Clean," they happily cleaned laundry from across the dimensions. Aka the Great Dark Forest, its mighty trees reached into the clouds. Navigation within was quite difficult, and one misstep from the path could result in one getting lost. Residents include the Rocs and the woman and her children. Katie and Bossko got lost here when her flight powers cut out and they crashed off the path. Ruling Poobah King of Elsewhere, he lived in the Castle Windsor of the Keep McCay (aka Palace of the Poobah). Though he already knew of Katie's presence in Elsewhere before her arrival, he had no idea how to send her back without a tag. He sent Katie & Bossko to the Oracle. A part of Elsewhere's terrain that Katie had to cross before reaching the Darkewolde. Giant bird-creatures, they dwelled in the Darkewolde and were apparently carnivorous. They captured Katie and Bossko, but then recognized her as having created all of the "ribbon candy" (her rainbow trail, solid within Elsewhere). Thankful for the delicious treat, they flew her to the Palace of the Poobah. For aeons, the Mother-Goddess watched over Elsewhere, but the kings came to resent the feminine nature of her energies and sought to harness energies of their own to mold to their will. For a time, the Mother-Goddess aided them as their Oracle, but ultimately the kings forgot everything. The Mother-Goddess subsequently had little to do with the goings on in Elsewhere but still tried to keep an eye on things. She was the queen of King McManus and, as the Oracle, she returned Katie to her home. Dwelling at a mansion isolated within the Darkewolde, she had a bunch of wild kids and needed a babysitter. Seeking directions on how to get out of the Darkewolde, Katie and Bossko stopped here. They told her they needed directions from someone who knew the Darkewolde well, and she told them that no one knew the Darkewolde like she did. She left them to babysit her kids, which exhausted them. In the morning, they asked her how to get out of the forest and to the capital, but, unfortunately, she knew the Darkewolde really well and could tell anyone how to get anywhere within it...but she knew nothing of the worlds outside or how to reach them.